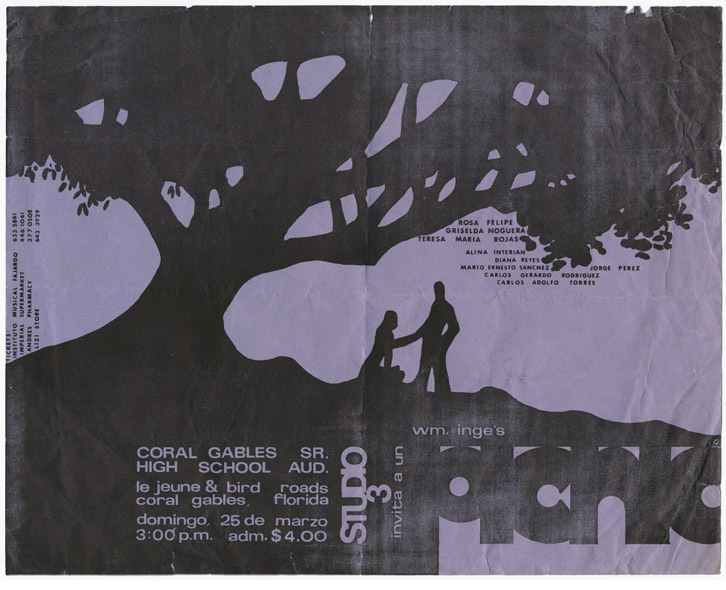 In Miami's Cuban exile community of the 1960s and 1970s, the unifying bond remained the enclave's ties to the homeland. 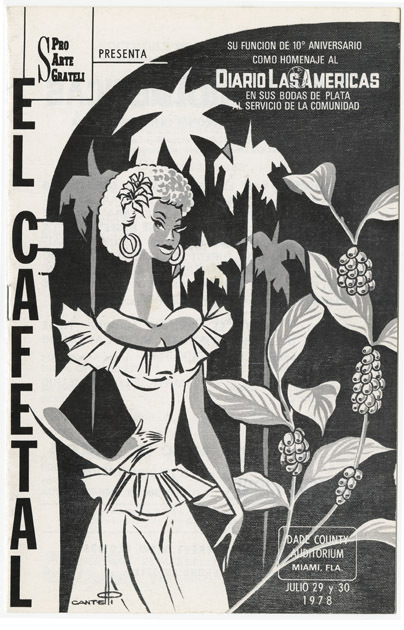 These ties influenced how Cuban theater developed in Miami, reflected in concepts such as the sala-teatro (pocket theater) and venues opening across Miami with names borrowed from Havana, such as Las Máscaras, Teatro Martí, and La Comedia. Another sign of attachment to the old country manifested itself in the kinds of shows favored by the new art and theater organizations. 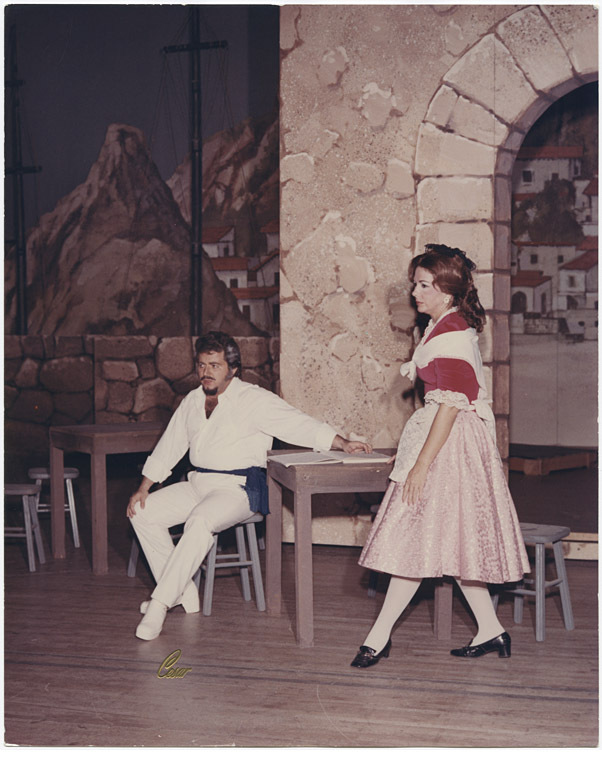 Whether dedicated to lyric theater, comedy, or drama works, they continued important traditions well-established in the island such as opera, zarzuela, and sainete, among others. 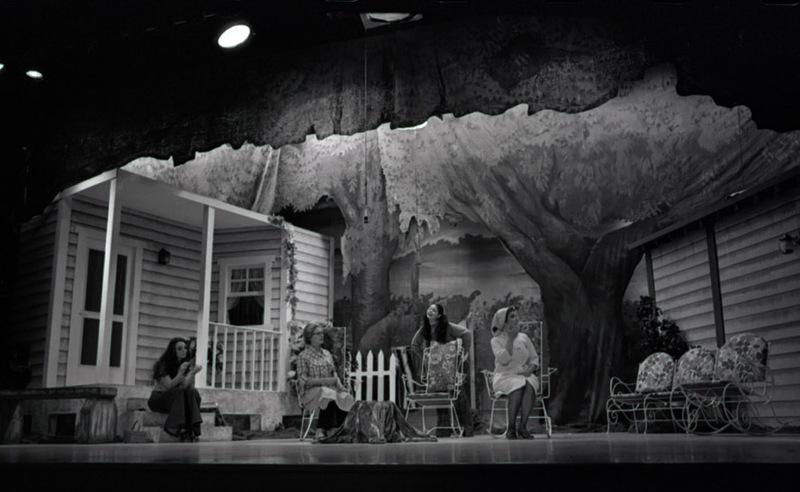 The theater seeds planted in the 1960s found fertile ground, as demonstrated by the organizations showcased in the last section and which are still active today. 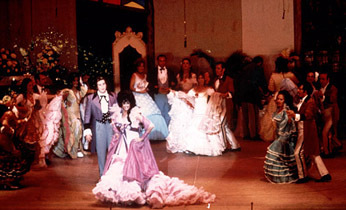 If the zarzuela was the theatrical genre favored by Cuban audiences in the first half of the 20th century, it is not surprising that the early exiles, composed mainly of Cuba's upper-middle classes, very soon started to produce in Miami the lyric genre in general and zarzuelas, both Spanish and Cuban, in particular. Lyric theater served to create an "imagined community" that continued to ally itself to the upper-class Cuba that no longer existed on the island or in exile. 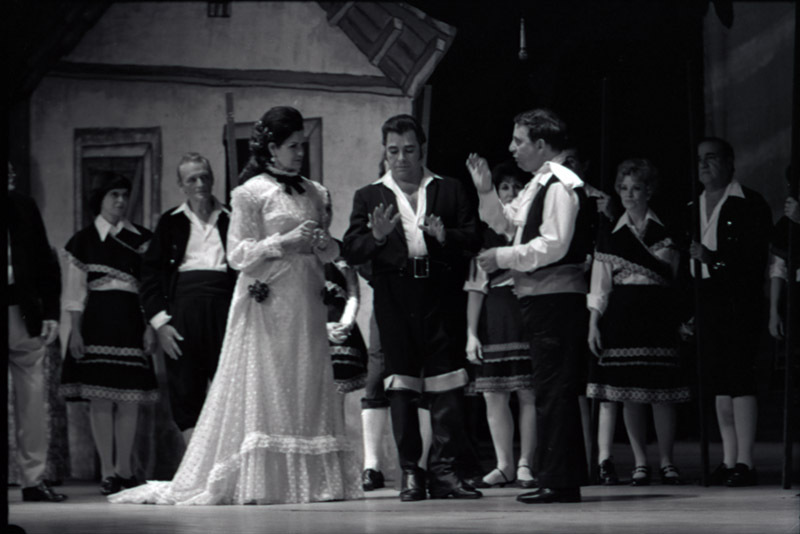 As an early program states, the zarzuela specifically was considered one of the best examples of the Spanish traditions important to Cubans and to those from other Latin American countries who were settling in Miami during the 1960s and 1970s. The zarzuela enthusiasm among the exile community even generated its own composers. 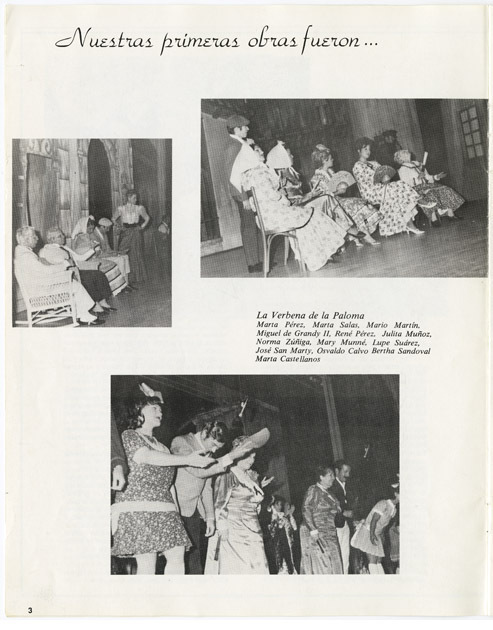 For exiles, zarzuelas were, and still are, prestigious social and cultural events, much like the opera was for Republican Cuba's upper and middle classes. In Miami, the lyric theater scene has been dominated by the enduring Sociedad Pro-Arte Grateli, which through the years has brought to South Florida a wide variety of offerings. Grateli is an acronym for Gran Teatro Lírío (Great Lyric Theater). The group's complete name, however, is reminiscent of Cuba's Sociedad Pro-Arte Musica, an association founded in Havana in 1918 that was responsible for the development of music and lyric theater in Republican Cuba. 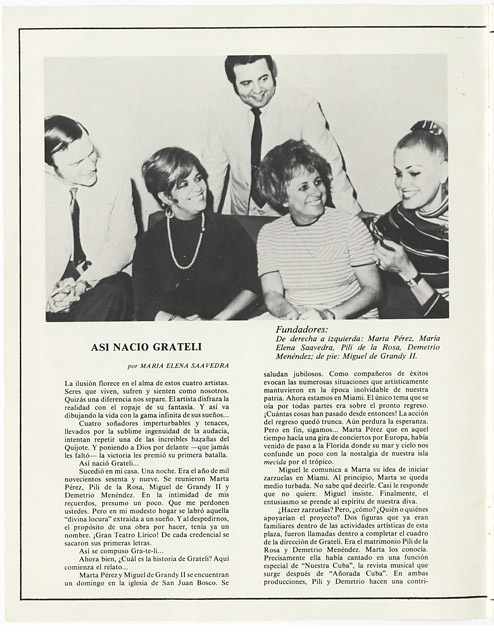 In this clip, Pili de la Rosa narrates the founding of Grateli in 1968 by herself, set designer Demetrio Menéndez, soprano star Marta Pérez, and actor Miguel de Grandy II. Marta Pérez and Miguel de Grandy II had formed part of Pro-Arte Musical's activities. 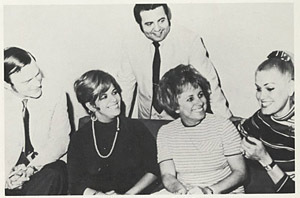 In addition to zarzuelas, Grateli also promoted the taste for popular music among Miami's Cuban audiences by including danzones, guajiras, sones, and even boleros in sainetes and bufo sketches in its programming. 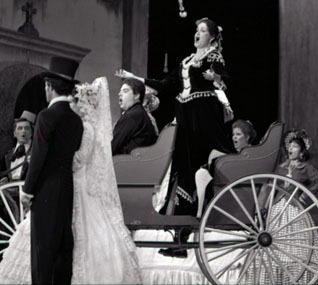 The first zarzuela that Grateli staged was the quintessential La verbena de la paloma (The Fair of the Dove, 1894). In this interview clip, Pili de la Rosa explains that even though they had no money for the production, each of Grateli's founders contributed $250 for the $1,000 needed to rent the Dade County Auditorium. 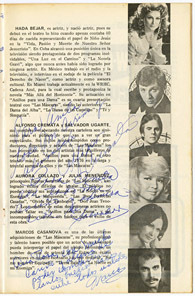 They were able to print an extensive program written in Spanish and English. In addition to theatrical information, the advertisements in the program demonstrate a well-developed ethnic enclave that, in only ten years, already had a candidate running for city commissioner of Hialeah. 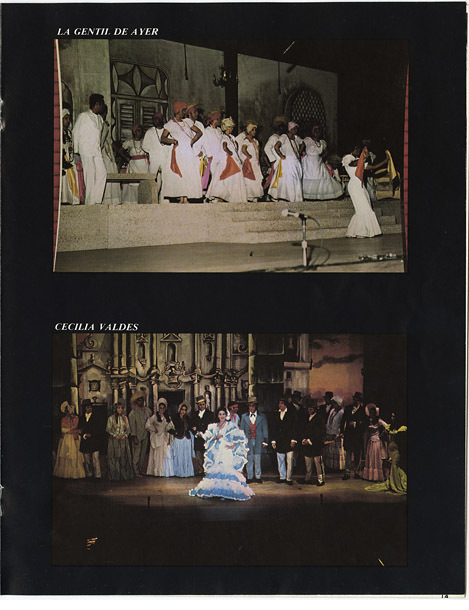 In 1970, Grateli presented the timeless Cuban zarzuela Cecilia Valdés (1932) by Gonzalo Roig, based on Cirilo Villaverde's antislavery novel Cecilia Valdés o la Loma del Angel (1839). Marta Pérez, who had the leading role in the New York premiere, shared the role of Cecilia with fellow soprano Blanca Varela. Cecilia is a lower-class mulata de rumbo (mulatta of the street), who could pass as white and is usually played by a white actress. 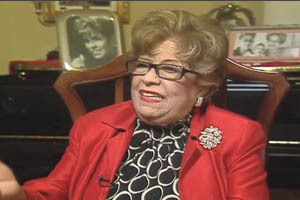 The affirmation of the song "Yo soy, Cecilia Valdés" ("I am, Cecilia Valdés"), as sung by Pérez, can be perceived as an affirmation of Cuban identity and culture by an exile community with emotional ties to both the music and the storyline. Grateli produced the U.S. premiere of Gustavo Sánchez Galarraga and Ernesto Lecuona's El cafetal (The Coffee Plantation, 1929) in 1978. 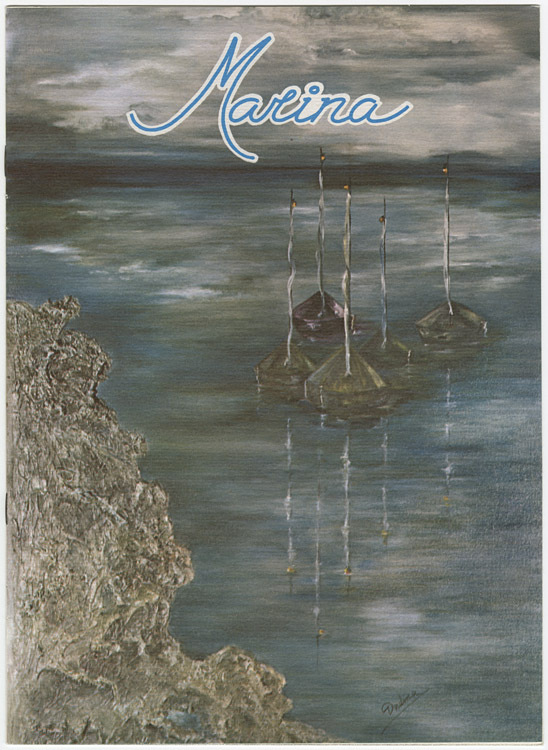 It is considered the first mature Cuban zarzuela because of its elaborate plot, choruses, and extended arias. It is also the first Cuban zarzuela in which the black protagonist is not the negrito of the bufo tradition. 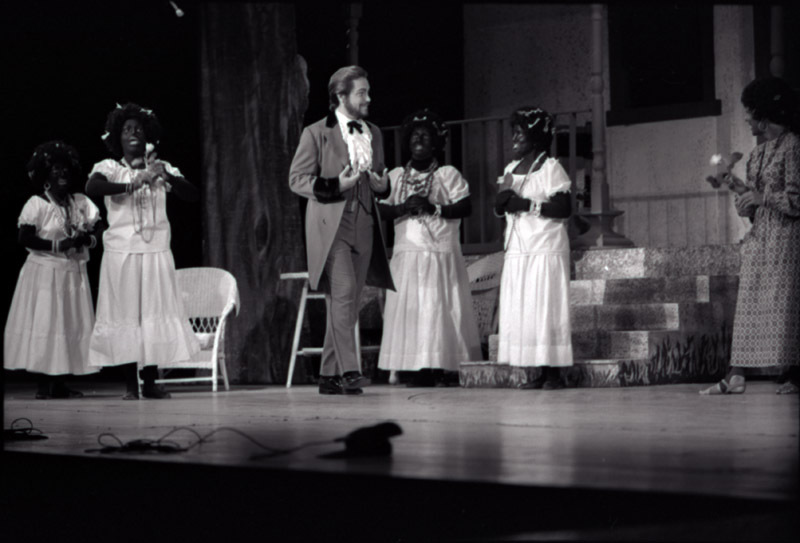 In Miami, as it was done in Cuba, most black characters as well as the classic slave chorus were performed in blackface. 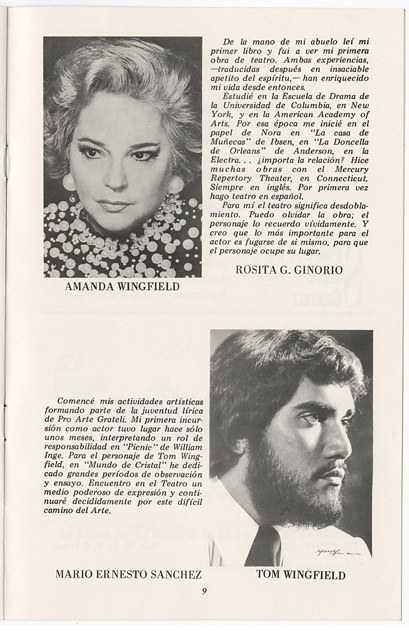 Luis Carballo wrote La gentil de ayer (The Graceful One of Yesteryears) in 1976 for soprano Virginia Alonso. 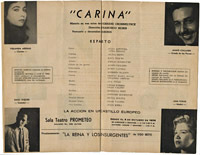 It was the first zarzuela authored in exile and bore witness to the enthusiasm generated by the genre in the community. The world premiere also included Chamaco García and Mara González. 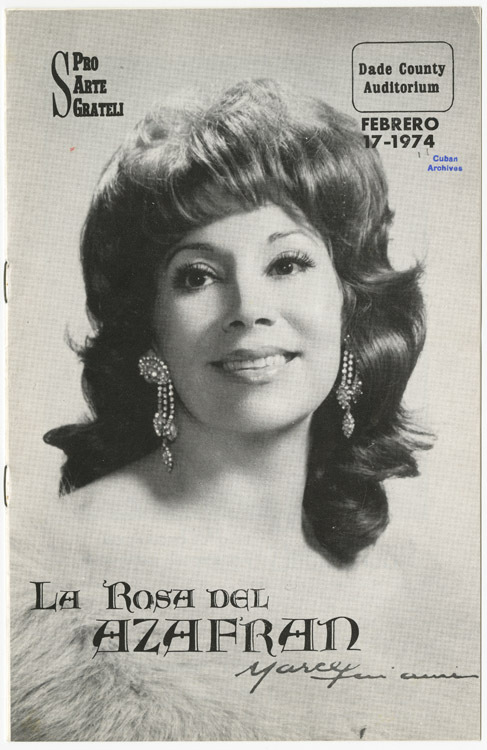 Throughout this period, Grateli implemented a subscription-based formula that helped them to produce the most important Spanish zarzuelas, including La rosa del azafrán (The Saffron Flower, 1930), Las Leandras (1931), Luisa Fernanda (1932), Doña Francisquita (1923), and Los gavilanes (The Hawks, 1923). Spanish zarzuelas allowed them to diversify their audience base since other Latin American immigrants and exiles were also familiar with the repertoire. FORUM and Sociedad Artístico Cultural de las Américas were companies that also produced zarzuelas such as Las Leandras (photograph) and María la O. Even Teatro Martí, known primarily for presenting comedies, initiated a season of zarzuelas following the tradition of Havana's Teatro Martí. 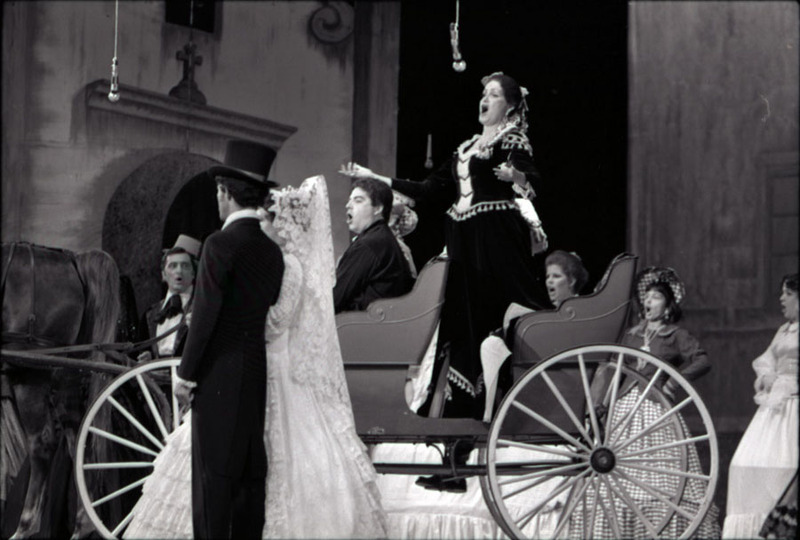 Operas and operettas were very popular in Cuba since the 19th century, and this tradition also crossed the Florida Straits. 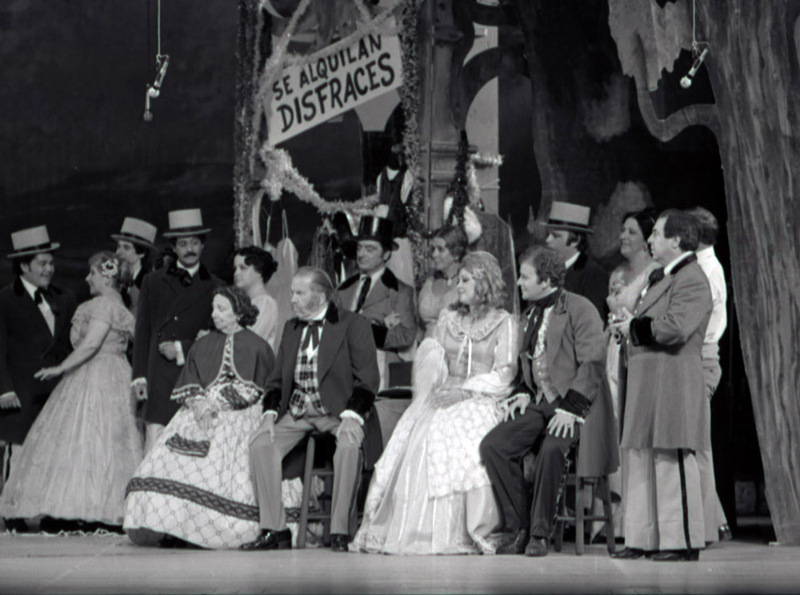 In 1972, Maestro Manuel Ochoa produced the U.S. premiere of Emilio Arrieta's Spanish opera Marina (1855). 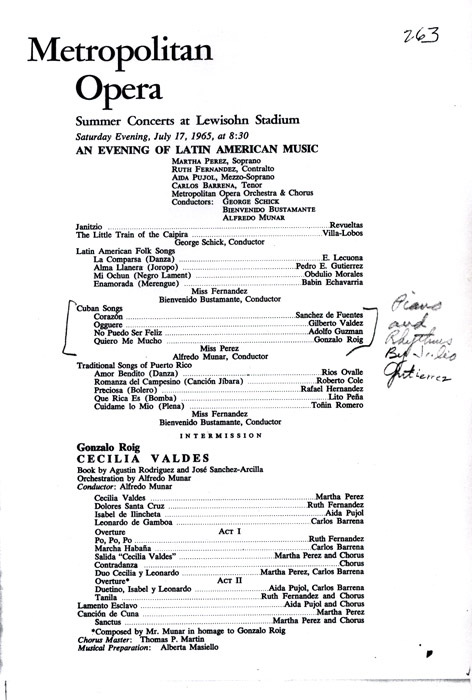 Opera Pan-Americana de Miami and Opera Guild of Greater Miami also produced operas and operettas for the Spanish-speaking audience, such as Jean Gilbert's La casta Susana (The Girl in the Taxi, 1910) and Franz Lehár's La viuda alegre (The Merry Widow, 1905). 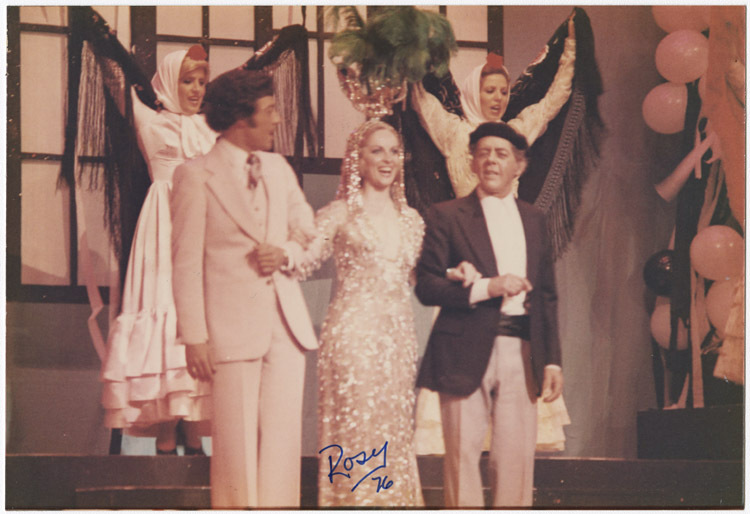 By the mid-1970s, Miami was undoubtedly the U.S. capital of zarzuelas, and even the leading voices from the New York City Opera and the Metropolitan Opera were lured to the city by them. Zarzuela's dance and musical numbers and conflicts appealed to the personal and collective struggles of communities trying to put down roots in a foreign country. 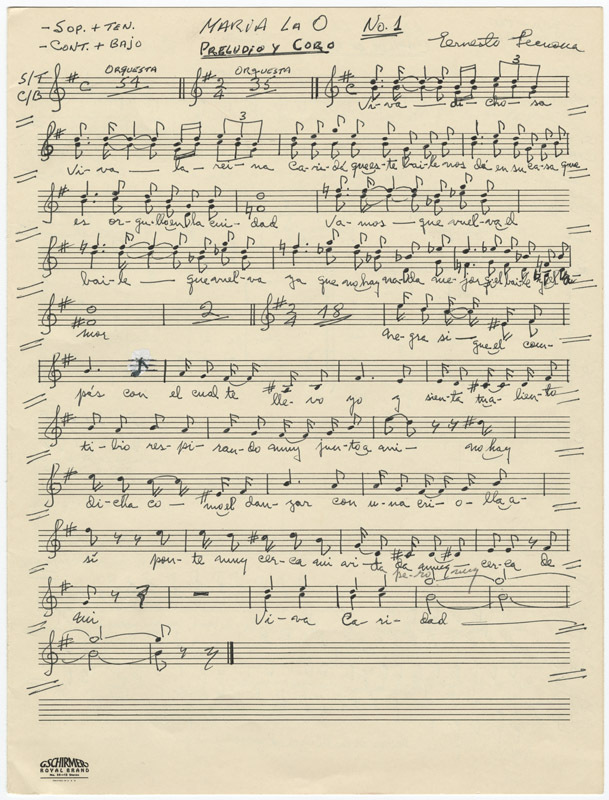 The popularity of lyric theater in general and zarzuelas in particular, within a Latino community in the making, demonstrates the ways in which music and spectacle worked not only as a projection of social status but as construction of ethnic identity. One of the major success stories in Miami's theatrical life is Teatro Prometeo at Miami-Dade College, the only Spanish-language conservatory in the country for actor training. Its creation can be attributed to two main factors: the artistic vision, will, and nerve of a truly committed theater artist, Teresa María Rojas and the pedagogical vision of Miami-Dade College President Eduardo Padrón. 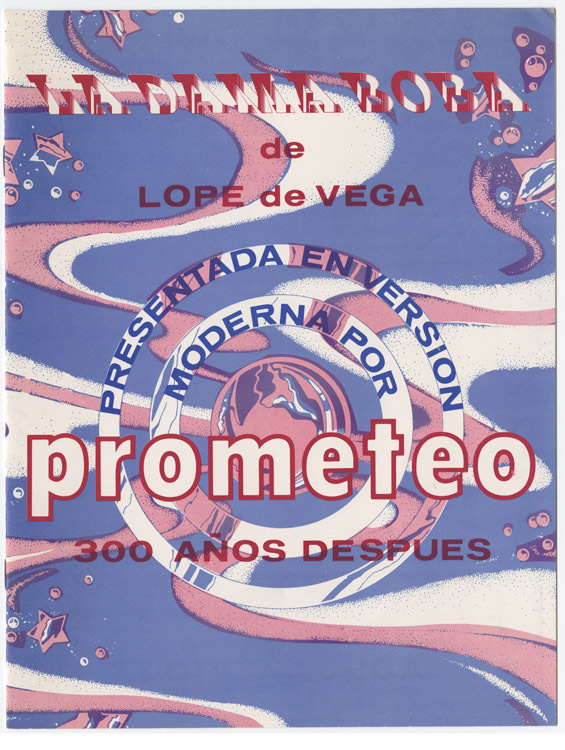 Throughout the years, Prometeo has featured many Miami and U.S. premieres of Cuban and international playwrights. It has also carried out programs specifically for young and elderly audiences and ventured into performances in non-traditional theater spaces such as community centers, the street, and public transportation. Prometeo continues to thrive today, with Colombian-born Joann María Yarrow as its current director. 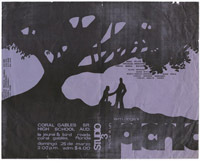 In 1973, Rojas and Griselda Nogueras founded the short-lived Studio Tres in Miami. 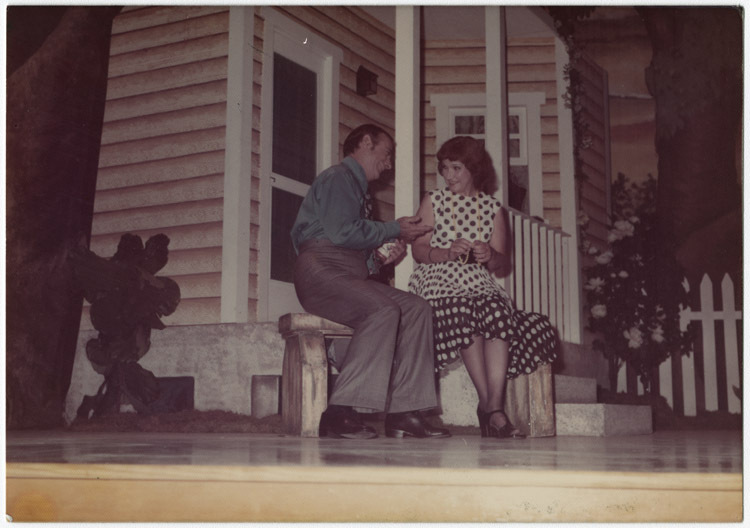 Their first Spanish-language production was William Inge's Picnic, which had premiered 20 years earlier on Broadway. They introduced to Miami a formula that would characterize Rojas' future productions: pairing at least one experienced, well-known actor with new, young faces. 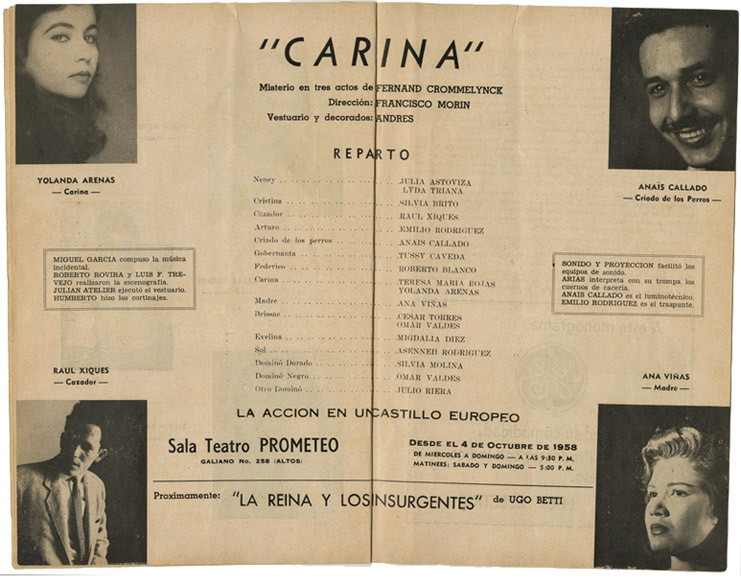 In this case, Picnic marked the return of the great Cuban actress Rosa Felipe to the stage along with then newcomers Mario Ernesto Sánchez and Alina Interián. 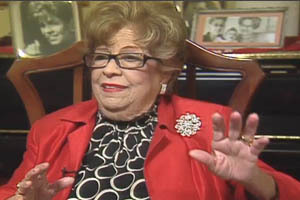 Rojas' experience with Picnic led to the creation of Miami's Teatro Prometeo. 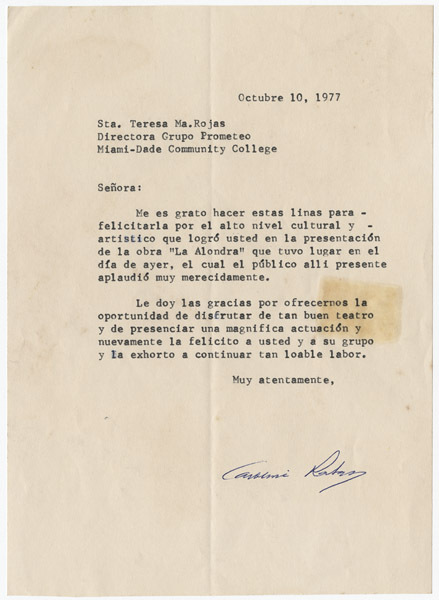 It took off in 1972 when Eduardo Padrón, then Dean of Education at what is today Miami-Dade College, asked Rojas to develop an acting program in Spanish for the school. The curriculum put in place by Rojas was similar to the Drama program offered in English and also led to an Associate's Degree. In this interview clip, Rojas narrates the history of the group when they rehearsed in a garage before being invited to Miami-Dade College's downtown campus and how they got their start at the College. Prometeo and its success owe much to a luminary of Cuban theater, Francisco Morín. 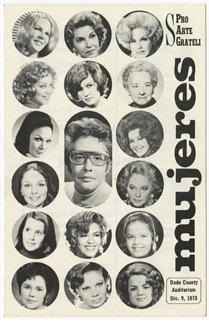 Teresa María Rojas was one of the female stars of Morín's famous Prometeo theater group in Havana. 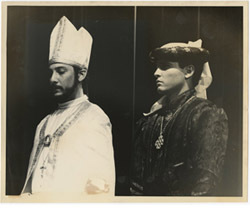 Founded in 1948,Morin's theater group was the training ground for many professional actors. Morín himself is considered one of Latin America's most accomplished directors, credited with ushering "Cuban theater into modernity" for his staging of Virgilio Piñera's Electra Garrigó in 1948. 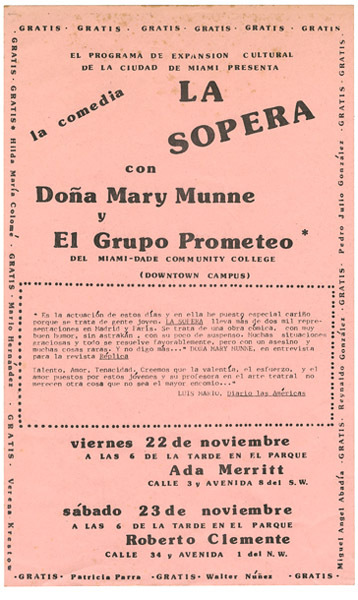 In launching a new theater program for Miami-Dade College, Rojas paid tribute to Morín by naming it Teatro Prometeo. 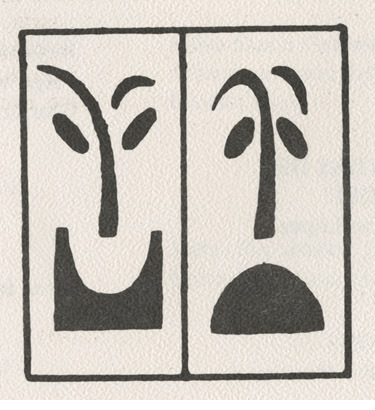 They also kept Andrés García's logo of two palm trees outlining the drama and comedy masks and implemented Morín's vision of theater as a laboratory for a continuous learning experience. 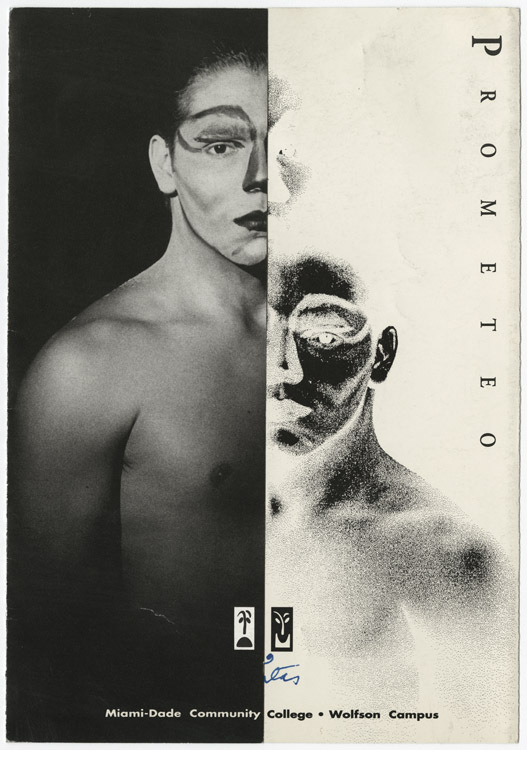 From the very beginning, Prometeo presented itself as a community theater with a mission to perform quality productions for free in different neighborhoods. One of their first full productions was Robert Lamoureux's French mystery farce La sopera (The Soup Bowl, 1971). 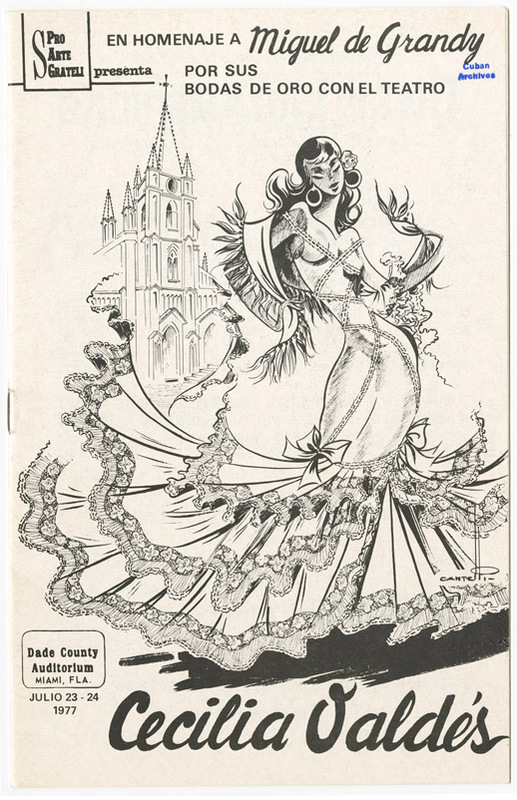 This show was staged first at Miami Senior High Auditorium and then presented in outdoor parks in Little Havana and Wynwood. Prometeo actors traveled through these neighborhoods on a fire truck announcing the performances. 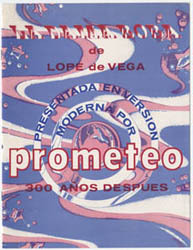 In 1975, Prometeo presented 2075. Written in Paris in 1963 by Teresa Casuso, it was one of the first science fiction plays shown on a Miami stage. In the play, a sleeping beauty wakes up one-hundred years later to find a perfect world where there is no pain, sickness, or envy. It was an innovation to place a television set on stage, with the audience able to see itself on it during the first part of the play. Rojas directed a rather large cast of 17 Promethean Players. Even though they received mixed reviews and despite the aged storyline, the acting, directing, and stage design made this play a major success for the acting troupe. 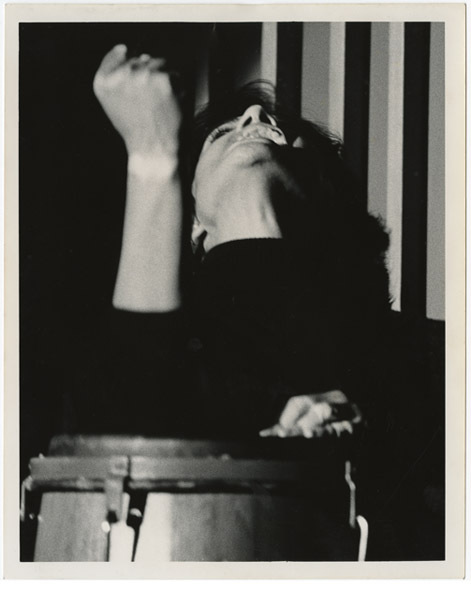 One of the highlights of Prometeo's performances was the presentation in 1976 of Lydia Cabrera's Suandende during a conference in her honor at Florida International University. 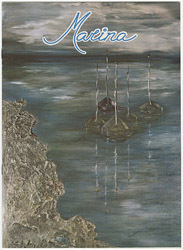 Cabrera was a renowned writer and authority on Afro-Cuban religions. 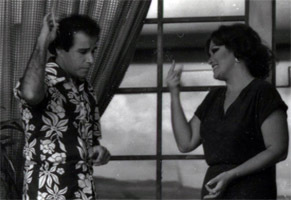 Rojas directed Cabrera's short story with choreography by Armando Navarro. The narrator (in the photograph on the left) also played the drums, providing rhythm and tempo to the performance. Prometeo celebrated its fifth anniversary with the production of Jean Anouilh's La alondra (The Lark) at Gusman Cultural Center. Almost 40 students were involved in the production. 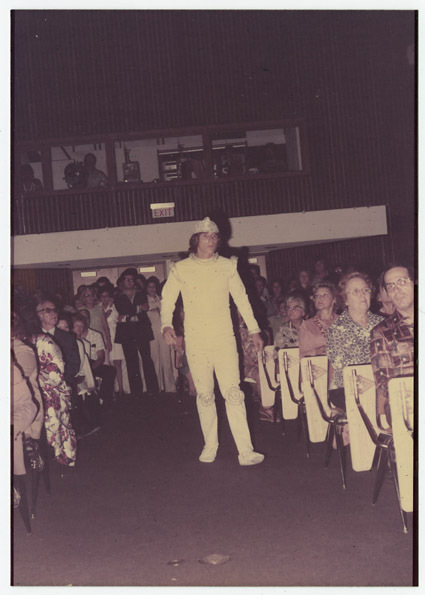 The group received many thank you notes for bringing to Miami quality theater, which meant a genre other than slapstick comedy. 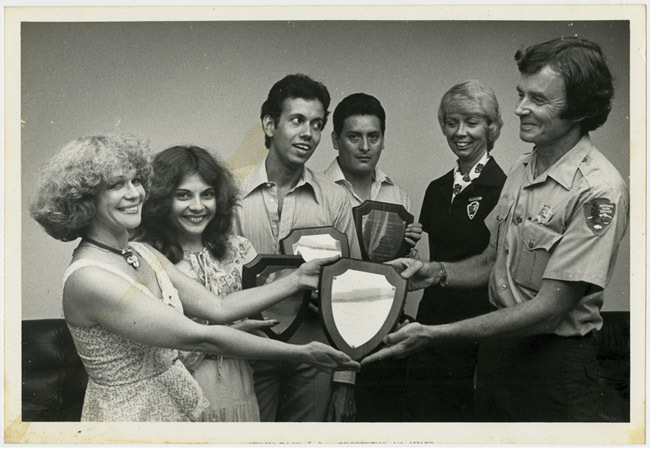 That same year, Rojas directed three other productions and won the Don Quijote Award for Cultural & Artistic Work. 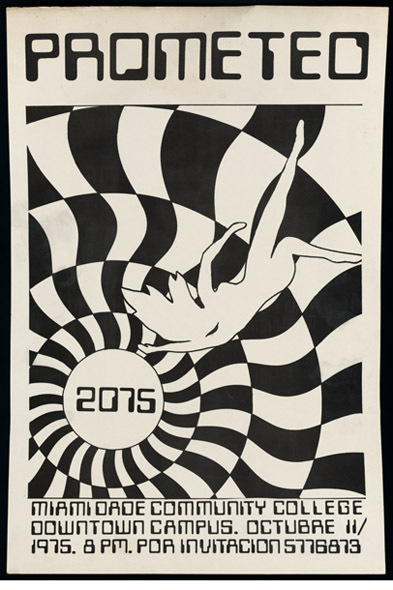 Towards the end of the decade, the Promethean Players embarked on a new journey: they started attending theater festivals and returned home with sweeping victories. 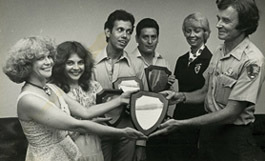 In 1978, they traveled to El Paso, Texas, to participate in the Golden Age Theater Festival, also known as Chamizal for the park in which the festival takes place. Prometeo competed with Calderón de la Barca's El Gran Teatro del Mundo and won all five top prizes. They are pictured here with the awards received at Chamizal. That same year they also competed at the American College Theatre Festival in Gainesville with Fernando Arrabal's Garden of Delights. 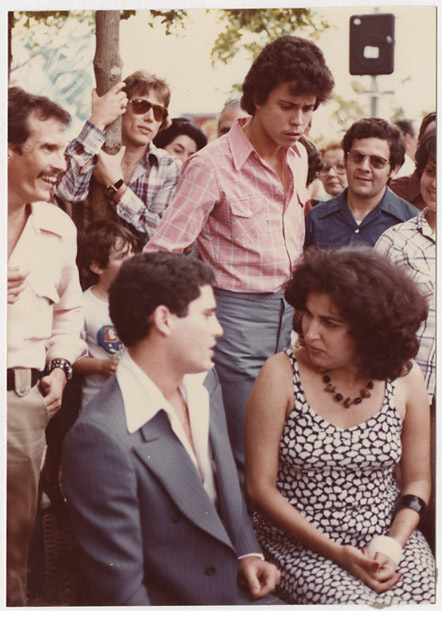 By 1979, when they returned to Chamizal with a modern version of Lope de Vega's La dama boba (The Foolish Lady), they were invited to open the festival. Rojas won best director for a second time, and the Players won best actor and best supporting actress awards. 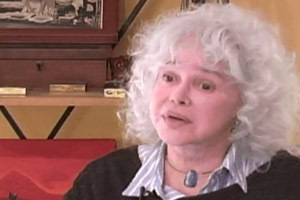 When Rojas was asked in an interview about her influence on others, she replied that she did not think she had had a major impact, as she explains in this clip. However, under Rojas' dynamic leadership, Prometeo incorporated Miami's best artists as teachers and offered a wide array of courses including acting, dance, expressive movement, singing, and stage and costume design. 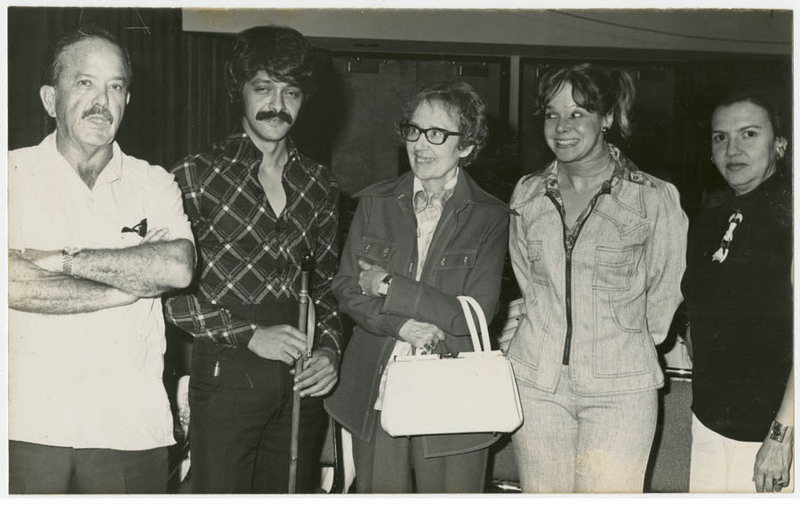 Throughout the years, Rojas created a multiethnic pool of actors for Miami by discovering, training, and nurturing important theater artists, such as Nilo Cruz, the first Latino Pulitzer prizewinner for theater, and Mario Ernesto Sánchez, founder and director of Teatro Avante. Prometeo and Teresa María Rojas changed the face of theater in Miami and the lives and minds of hundreds of individuals. For most of the Promethean Players, she really taught them the value of life and what it meant to be an artist, as shown in a student's thank you note. In Rojas' own words: "My ambition is not to see my players in Broadway or Hollywood but to make them live 24 hours a day as artists. In that way they will live life to the fullest." The resilience of the individuals and theater organizations featured in this section speaks volumes about their capacity to survive and grow in the midst of challenges of all kinds. Not only were they able to adapt to the values of their new society, but they also mirrored throughout their work a shared human experience based on the impact of exodus and resettlement and a mission to bring first-rate theater to their new hometown and to do it in their mother tongue, Spanish. 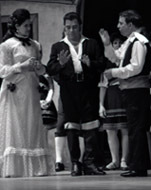 In 1979, Mario Ernesto Sánchez, Alina Interián, and Teresa María Rojas founded RAS, which later became Teatro Avante. The consummation of their efforts can be seen in their over 30 years of existence and their creation of the prestigious International Hispanic Theatre Festival of Miami, now in its 27th edition, under Sánchez's determined stewardship. The other two companies profiled in this section, Teatro Bellas Artes and Hispanic Theater Guild (Teatro 8), have also persevered in bringing universal theater to their Spanish-speaking audiences. 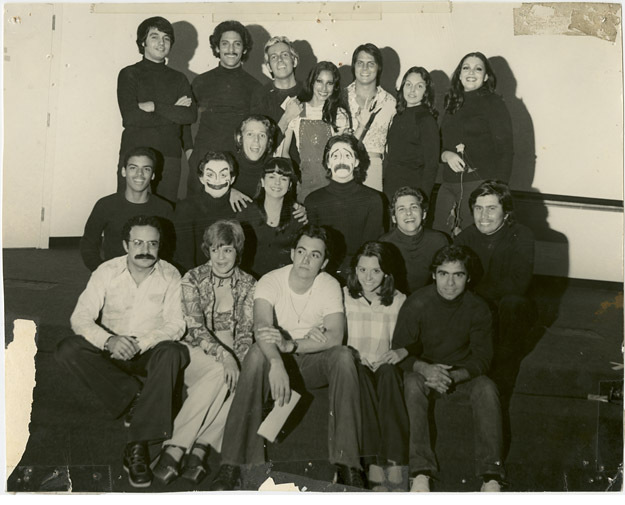 In 1978, ex-Promethean Player Alina Interián and Mario Ernesto Sánchez joined forces with Teresa María Rojas to create RAS Community Theater, the company that would become Teatro Avante in 1986. They opened their first space in 1981 with floor and light plans designed by María Julia Casanova. Between 1981 and 1986 the name RAS and Teatro Avante were used interchangeably, although RAS was the theater group and Avante its theatrical space. From the very beginning, the organization's main goal was the preservation of Hispanic, especially Cuban, cultural heritage. They chose Virgilio Piñera's Electra Garrigó for its inauguration and brought Francisco Morín to direct it. 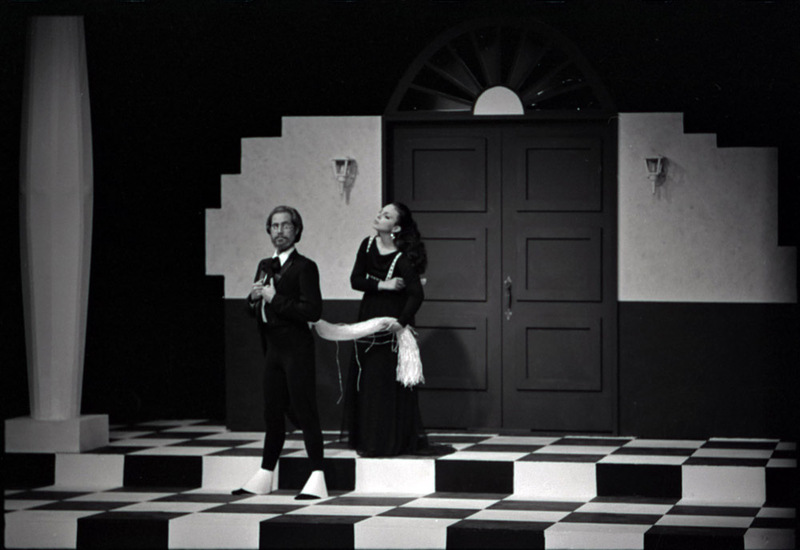 This was the first Piñera play staged by Avante, which would go on to produce a number of additional works by Piñera, including the world premiere of Piñera's Una caja de zapatos vacía (An Empty Shoebox, 1987). 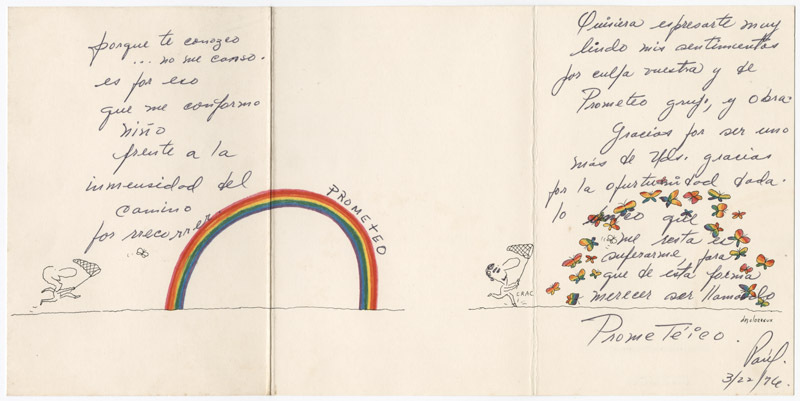 Mario Ernesto Sánchez arrived in the U.S. in 1962 through Operation Pedro Pan, a program that saw 14,000 Cuban children arrive in exile during the 1960s without their parents. 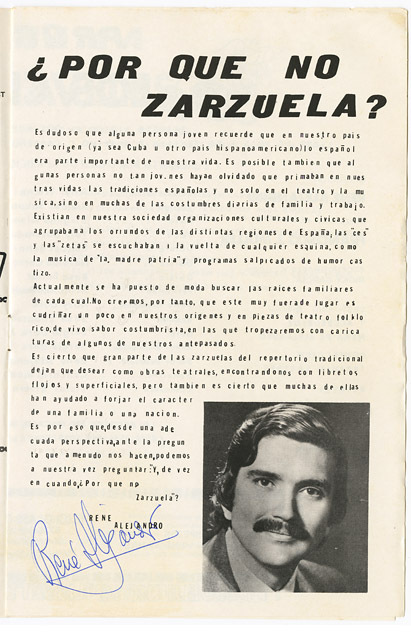 Sánchez started his theatrical career singing and dancing in Añorada Cuba and playing the character of Perucho Figueredo in Manuel Ochoa's De Belén a Bayamo in 1968. After studying with Teresa María Rojas and Griselda Nogueras, he went on to work at Prometeo, acting and directing for the company. 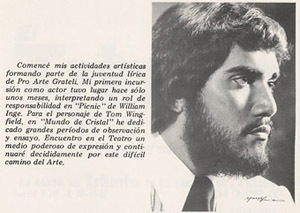 Sánchez became a regular in the Miami theater scene of the 1970s, performing with groups ranging from Grateli to Studio Tres and El Carrusel. 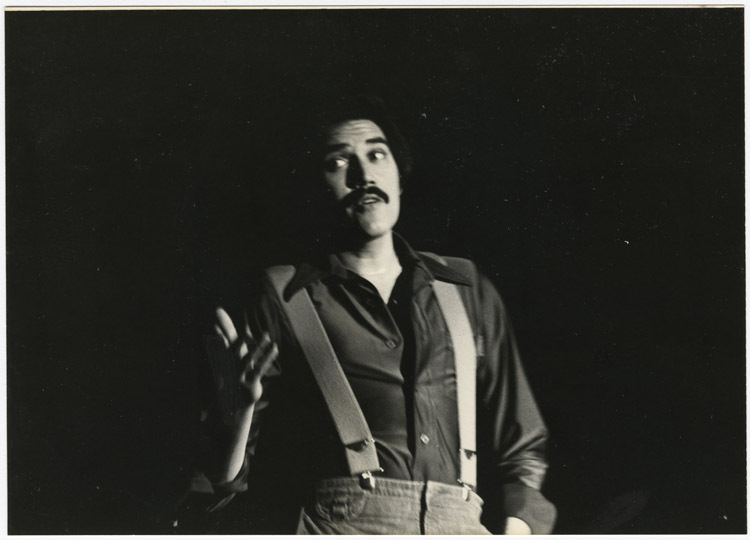 At the helm of his group, Teatro Avante, he has received numerous awards throughout the years including the "Distinguished Career Award" from the Florida Theatre Conference for his contribution to the development of theater in Florida. Alina Interián entered the world of the theater in the early 1970s after training under Teresa María Rojas. 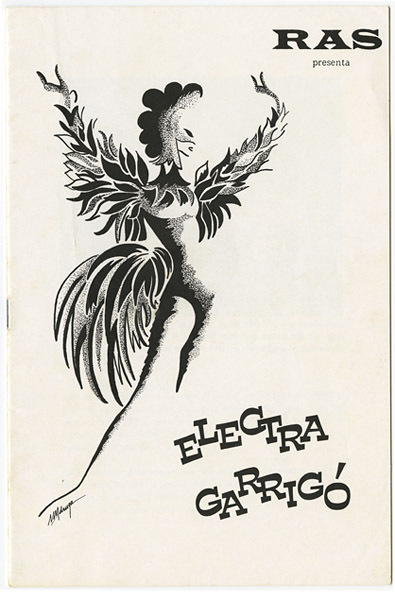 As one of the co-founders of RAS/Teatro Avante in 1978, she starred in their inaugural production of Virgilio Piñera's Electra Garrigó. 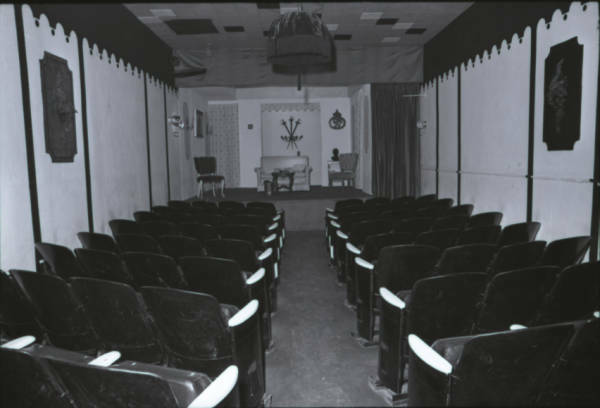 Interián was also part of the opening of the new theater space, establishing the name of Teatro Avante with Bernard Slade's Homenaje (Tribute) in 1981. She is currently the Executive Director of The Florida Center for the Literary Arts at Miami-Dade College, which organizes the Miami Book Fair International and oversees Prometeo Theater. 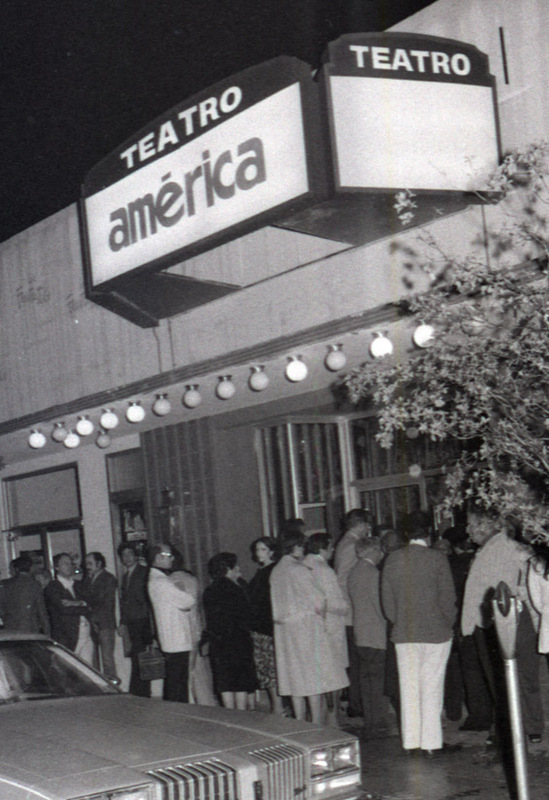 In 1978, Teatro América took over a space that had been renovated by New York's Repertorio Español when they launched a theater venture in Miami. Teatro América focused on musical theater and comedies, like most of their colleagues at the time. In the early 1980s, Teatro América became Teatro de Bellas Artes and soon Pili de la Rosa and María Julia Casanova joined the new theater as directors. Bellas Artes' inaugural musical comedy Lucy was adapted by Casanova with music by Anam Munar. Lucy Pereda and Carlos Grillone (as pictured) played the leading roles. 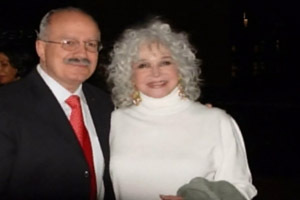 Marcos Casanova arrived in Miami in 1974 and acted in many important plays such as Antonio Gala's Anillos para una dama (Rings for a Lady) as well as comedies. 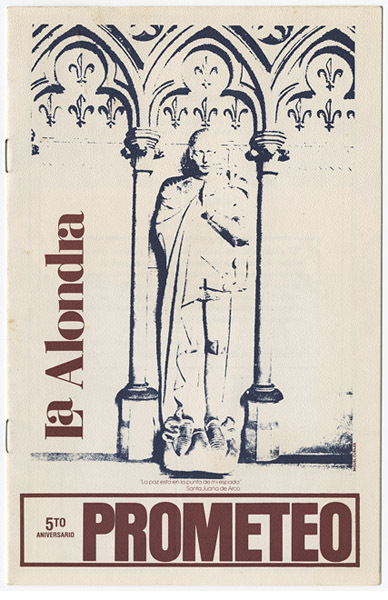 In 1987, he became famous as a playwright for his comedy Las Carbonell en la Villa Jabón Candado (The Carbonell Sisters in Candado's Villas), inspired by Raúl de Cárdenas' Las Carbonell de la Calle Obispo, and he won the Letras de Oro prize in 1994 for La libertad prestada (Borrowed Freedom). 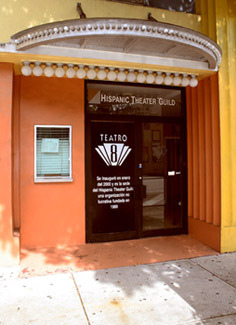 The actor-director was also involved in the founding of the Hispanic Theater Guild in 1989 and the opening of its theater venue, Teatro 8, in 2000, which occupies the former Teatro Casanova created by María Julia Casanova (no relation) in 1992. Teatro 8 has been responsible for innumerable premieres including the Spanish-language world premiere of Nilo Cruz's Two sisters and a piano in 2007. What began as the Hispanic Theater Festival in 1986 is today the International Hispanic Theatre Festival, the longest running theater festival of its kind in the U.S. Produced by Teatro Avante and Mario Ernesto Sánchez, the Festival is recognized as "the most distinguished U.S. portal to the Americas" by American Theatre editor Randy Gener (2010) and has received several international awards. 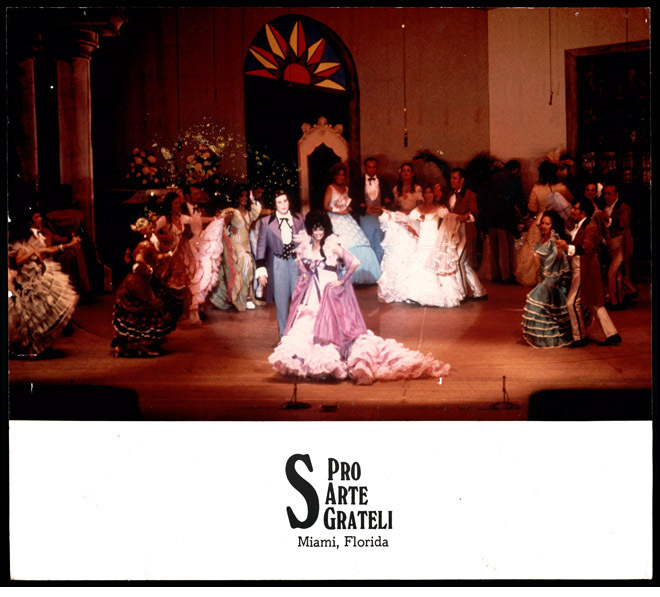 Its precursors were the Gran Festival de las Salas Teatro de Miami (Great Festivals of Miami's Pocket Theaters), first held in 1975 with the participation of the most important local Spanish-language companies; and the yearly Festival of Ethnic Theater, organized by Sánchez between 1984 and 1986, that presented one-act plays by Jewish, Black, and Hispanic artists.